We love Cape May! And we love sharing unusual stories about it’s past while biking around town. 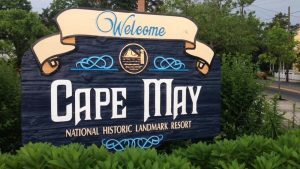 As Cape May residents, we all took unique paths to find our way to this town. One of us spent summers in Cape May as a child and returned to raise her own family, one of us has been coming to the Jersey shore her entire adult life to escape the hustle and bustle of corporate America, and one of us is a self-proclaimed “water baby” from Virginia who recently discovered this amazing seaside town. But no matter how we got here, we all have a passion for living life to the fullest. That means enjoying a healthy lifestyle, being active participants in our community, and taking advantage of all that Cape May has to offer. And we want to share all of that with you – on two wheels! We hope that you will take time during your visit to Cape May to join us on one of our bike tours. And we hope that you find it to be a memorable journey through this curious town. The best part of memories is making them!